(Photo: © Peter Kenny / Ecumenical News)Rev. 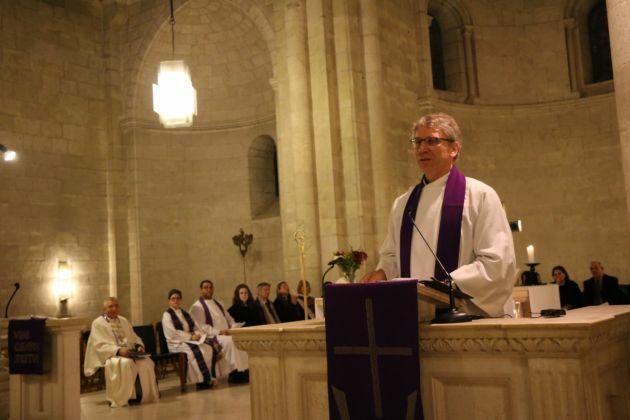 Olav Fykse Tveit, general secretary of the World Council of Churches preaches at the (Lutheran) Church of the Holy Redeemer in Jerusalem on Feb. 10, 2016. Churches and other religious communities are not engaged in humanitarian responses and development due to the United Nations' Sustainable Development Goals, but because of their fundamental faith commitments. Rev. Olav Fykse Tveit, general secretary of the World Council of Churches, said that churches engage in development due to their "respecting human dignity, to serving the community, to protecting creation, and to witnessing to the divine." He was delivering a keynote speech Dec. 17 in Berlin entitled "The role of religion in sustainable development and peace" at which German federal cabinet ministers and other high ranking officials were present. "The faith that is our fundamental point of reference is expressed and brought into action in many ways," said Tveit a Norwegian Lutheran. This is manifest through "confidence and trust in God, in the content of doctrine, in the teaching of the tradition, in a commitment to serve and share, in embodying a community of faith and practice, in common witness in words and deeds." Tveit said religion has sometimes been seen as an impediment to development and it can only overcome being part of the problem if religious believers understand they are part of the problem. "Our mutual accountability to one another as religious partners must include first of all our accountability to all those people whom the religious leaders and communities are called to serve. "Here I believe that there is a common standard for many in 'the preferential option for the poor.'" The scripture based principle was developed by liberation theology, and later adopted by the ecumenical movement and particularly by the WCC as a criterion for advocacy and service. "We also see that the World Bank uses this terminology now," said Tveit. He noted that 40 years ago that social scientist Peter L. Berger propagated the secularization theory. "Today he has changed his opinion, recognizing that in most parts of the world religions are flourishing. In the past, Central and Western Europe seemed to be the model for a secular future. Today it is clear that they are an exception," said the WCC leader. "Accepting that his secularization theory was wrong, Professor Berger – like many others – began to see that in practically all parts of the world religion is very much alive. "It is not limited to the function of coping with moments of uncertainty and crisis in one's private life, but remains a key factor shaping life in community," said Tveit. Religions shape the lives and important decisions of many families and communities on strongly based values. "With their holistic world views, religions continue to challenge the development of economic and political sub-systems that dominate societies and undermine and fragment life in community. "At their best, religious communities and religious leaders have raised their voices in the context of economic injustice and rampant inequality, the misuse of political power, the ugly face of racism or of violence against women and children." Tveit said religious pluralism and multi-religious societies have become ever more significant in the context of globalization, migration and massive flows of refugees. "Yet with a shared commitment to the flourishing of communities and nature, religious leaders are able to cooperate across faith boundaries to demonstrate care for creation, justice, reconciliation and peace," said the WCC head. • Interfaith cooperation at the COP 21, the U.N. climate conference in Paris at the end of 2015 with "a common witness of religious leaders addressing climate change." • Hope for young people in Egypt in cooperation with Al Azhar and the Coptic Orthodox Church. • Action against violence and for reconciliation of communities in Nigeria. • Interfaith coalitions for gender justice. "In confronting the current crisis of compassion affecting Europe and the international community's response to people fleeing from conflicts and oppression in Syria and elsewhere, we sought cooperation with the UN and other partners through a High-Level Conference convened in January this year," said Tveit. He said there was an affirmative response to that initiative from UNICEF, UNHCR, UNFPA and from the German government (represented by Federal Minister of the Interior Dr. Thomas de Maizière. "It was a clear example of the growing interest we have seen in recent years among governmental, intergovernmental and civil society partners in a more active and constructive relationship with religious leaders, faith communities and faith-based organizations," Tveit explained. "The role of religion should be one that gives hope. This potential to give hope (sometimes against hope or general optimism) should be a prime criterion for the sound critique of religion," he said.